Located just off the A432 junction, many people flying into Lyon Saint Exupery Airport (LYS) choose to rent a car. There are six car rental companies available at the airport, all offering competitive prices. It is usually best to reserve a hire car in advance of your trip to Lyon, as cheaper rates can be found by booking online in advance. Most agencies have a wide range of vehicles on offer, including the latest sedans, sports cars and a number of luxury vehicles. When renting a car at Lyon Saint Exupery Airport, you must have held a valid driving licence for at least one year and be aged 25 or more. Insurance is always included in the price, although the cover is usually fairly basic and large excesses can be payable in the event of even a minor accident or scrape. For a small charge, the level of insurance can be increased and this is often worth considering. Lyon is easy to drive around and parking is rarely a problem. A network of ring roads and fast highways feed the city, making nearby towns and cities simple to find, such as Grenoble, which is situated to the south-east and can be reached in just over one hour by car. 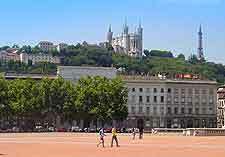 Book your Lyon Car Rental here.